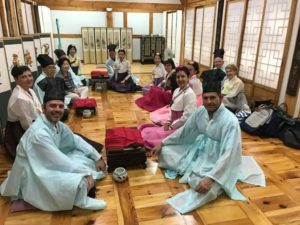 This is the second installment of a blogpost on Marios Epaminondas’ study visit to Seoul, Korea, which took place from 22-28 July 2017. (N.B: In this report the terms Korea, Republic of Korea and South Korea are used interchangeably unless stated otherwise) It is the fifth article in a series of reports and blogposts related to the project “Dealing with the Past in History Education”. The preceding blogpost on Marios’ visit can be found here. Educating the children of North Korean defectors which have moved to South Korea either directly or through third counties, mainly China, is also an issue related with the understanding of the past. In this case, there is no dispute or attempted dialogue with North Korean authorities. Rather, there are efforts to educate the people who chose to come to South Korea in ways that will help them integrate in society. Apart from issues related to language (for the children who spend many years in China on the way to South Korea) there is a need for a new understanding of the recent past. Teacher Hyeonjin Chae working in Hangyeore High School which welcomes North Korean defector children said that this particular school offers both the regular curriculum and a specialized one to help defector students adapt and be transferred eventually to regular South Korean schools. During their history class, they tackle particular issues which are presented in different ways in North and South Korea. Methodologically, the school adopts group work and dialogue. Content wise, there is still dialogue; nevertheless the South Korean narrative should eventually prevail. For example, regarding the very crucial issue of Korean war, about which in North Korea it is taught that South Korea invaded first, teacher Chae explained that “I provided students with some documents that supported the argument that the Korean war started when North Korea invaded South Korea” (p.125). What educational programmes exist which deal with the past? South Korea’s education is divided in three levels: Elementary School six years, Middle School three years and high School three years. According to Sun Joo Kang, Professor at Gyeogin National University of Education (p. 61-62) the Korean national syllabus has changed several times since its first release in 1948. A crucial change occurred in 2011 when a nine year common basic and three year selection based curriculum was adopted. According to this curriculum, students study Korean History at the primary school, middle and high school levels each with different themes, depth and standards. World history is compulsory in Middle school, whereas in High School students choose from a variety of social science courses which include Korean History, East Asian History and World History. This entailed that Korean History was not compulsory in High School. However, historiographical and territorial disputes with Japan and China sparked reactions among the public and the politicians which disagreed with the fact that the subject of Korean History was only optional. “As a result, the Ministry of Education, Science and Technology (MEST) just before implementing the 2011 curriculum, in which all courses in High School were to be electives strongly recommended that High School should teach Korean history as if it were a compulsory subject. Korean history has always been more prominent in school curricula than world history because History Education has been viewed as a means for establishing national consciousness and cultural transmission” (Sun Joo Kang, p. 62). The prevalence of the “task” of History Education to instill national consciousness was evident in all formal and informal discussions held in the framework of the Conference. There was also a discussion about the contribution of history education to the enhancement of civic competences and promotion of active citizenship. These directions of history education, as described by the researchers who studied the official deliberations on the subject are, to a large extend, in line with the information gathered from 35 3rd Grade students of Choong Ang High School. Answering the question “Why should we learn history” the students gave responses clustered around four main areas: a) to provide lessons from the past in order to avoid repeating mistakes, (b) to construct a national identity, (c) to orientate the citizens as to who are they and where they should go and (d) to understand/respect “others” and live in peace with them. 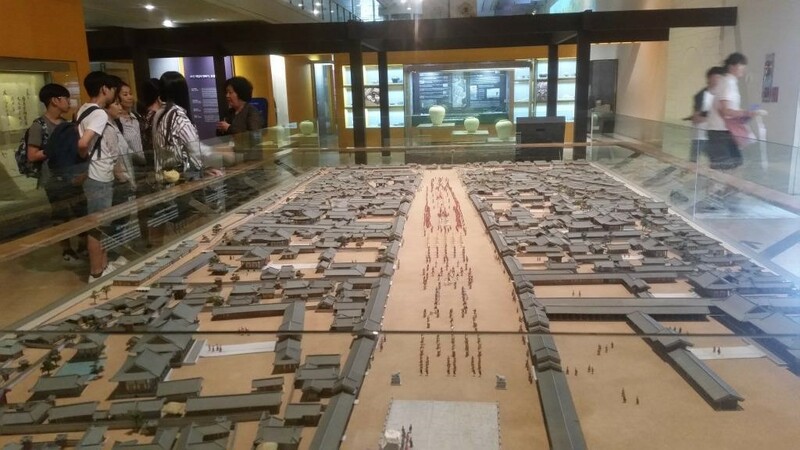 Apart from the educational programmes offered in schools, another arena in which South Korea’s relation with its past is negotiated and presented are the Museums. Seoul has a very rich Museum scene covering themes related not only to political, but also the cultural and social history of the country. The Museums are generally well structured, attractive and rich in content. The narratives underlying the collections are diverse and are offering the chance for reflection. It is interesting to note that post war history of South Korea is presented in a dynamic and critical way. One could have assumed that in an attempt to compare favorably the liberal/capitalistic system espoused in South Korea with the communist/authoritarian system of North Korea the former would somehow be idealized. On the contrary, the development of South Korea’s political life is portrayed as an on-going struggle towards democratization. Of course this can be perceived as implicit presentation of the assets of an open society, nevertheless it is done in an honest and “self-critical” manner, the “self” being the governments in South Korea after 1953. An interesting instance of this reflective approach occurred during the visit at the Demilitarized Zone when the tour guide was commenting on the efforts for dialogue with North Korea. She stated that the progress of dialogue is contingent not only to the stance to the North Korean Government but also to the willingness of the South Korean government. This is interesting because usually tour guides are echoing the official point of view and attribute lack of progress to a dialogue solely to the “other side”. What is the notion of good history education and how does it contribute to dealing with difficult past? The emphasis on the establishment of corrected/shared perceptions of the past is prevailing in the discussions about History Education. This brings the content at the center of the discussions. The issues of history didactics and teacher training remain secondary, nevertheless there seems to be an upward trend in the interest of their development. Professor Lyu Seungreul, Kangwon National University explained that the current system is focusing on memorization and the success in particular University entrance exams leaving limited space for agency to the students. Recounting opinions withheld by some teachers which are in line with his own vision for the future of history education he says “…the way in which the learners are perceived must change: they should not be seen as passive beings accepting historical research but as main agents of historical interpretation” (p. 46). The struggle for the “right content” is consuming much of the energy of many of the official stakeholders dealing with history and history education. The rectification of history is one of the main tasks undertaken by the NAHF. According to the line of argument expressed by the members of the NAHF a good History Education should be based on “shared perceptions” of the history of Northeast Asia. These shared perceptions should/could be established through a dialogue –of historians- between Korea-Japan-China. Such shared perception(s) will consequently allow the creation of joint textbooks which in turn will be the core of history class. The effort is difficult; however, there were attempts towards this direction, which were commented positively by Professor Lyu: “There have been active solidary movements between Korea and Japan to overcome historical conflicts and bring reconciliation. To ensure cooperation between individuals and institutions, this happened on a private, non-Governmental level: history researchers and educators have conducted joint research to bridge the gap in historical perceptions” (p. 40). According to Professor Lyu, the quality of the “shared perceptions” sought after shall be judged not only by their historical accuracy but also by the values they would convey. They should “fulfil the universal values ultimately pursued by East Asia and even humanity, such as world peace, human rights and democracy (…), must eliminate historical perceptions that dignify invasion and colonization, justify war and rationalize violence and suppression”(Lyu, p. 41).The outcome pursued gives implications of who should have the leading role in this endeavor: “Korea may play a key role in sharing historical perceptions or promoting projects for future peace and co-prosperity, due its absence of historical sins, whereas China and Japan face difficulty in and East Asian community due to their imperial sins” (Lyu, p. 43). In any case, it is not clear whether the “shared perceptions” will be a commonly accepted narrative or “recognizing the Korean perspective and the Japanese perspective, for instance, are different and educating students to understand why these differences in perspective exist” (Lee, p. 58). On top of that, it is acknowledged that the issue of content is not covered only by the relations between Korea, Japan and China. There are open discussions about ethnocentrism, tackling of multiple identities within South Korea and the balance between national and world history. Whereas the focus is on content, the Foundation officials, researchers and history teachers share the opinion that History Education is not only a matter of content. The discussions in the conference provided clear indications that there is a need, especially on behalf of the teachers, for more emphasis on the methodology of history teaching and the adoption of more student centered approaches. An area which seems to receive much attention in Korea concerns the so called “civic history education”. The rationale is this: “‘Education to raise citizens’ is the basic concept behind civic education, ‘history education to raise citizens’ provides civic education using historical facts and fundamentally aligns with the nature of civic education” (Kim, p. 181). A question which arises is whether history education can be used to promote civic competences without losing its original direction which is learning history for history’s sake. While the search for the right content and the dialogue about the extent to which history education can serve other subjects outside history prober is ongoing, there are other aspects or history education considered important. The discussion with history teachers on the 27th of July revealed that there is an eagerness to explore the methodology of history teaching more and to share experience with colleagues from other regions of the world, especially Europe. It was also evident that the work of EUROCLIO is well respected, but not fully understood. This opens up a very good possibility for a cooperation of NAHF and EUROCLIO in the area of teacher training. Such trainings might, at some point in the future, include participants from other countries of North East Asia. History education in South Korea has received special attention during the last years because it is perceived to be closely related with the (re)search and the transmission of the “right content” regarding the past of Northeast Asia. Dealing with the past seems to be, for many Korean stakeholders, a moral, political and scientific obligation to counter unacceptable claims made by Japanese and Chinese authorities. This historiographical struggle is related indirectly but obviously to current political disputes about territory and sovereignty especially with Japan. The optimum scenario, according to the South Korean view, as portrait by speakers in the NAHF conference, is to reach “shared perceptions” of Northeast Asia, which will be accepted and adopted by Korea, Japan and China. It is understandable that this is easier said than done. There is an explicit worry that Japanese and Chinese authorities are reluctant to move towards this direction and a more implicit that should such a dialogue takes place, Korea cannot make “compromises” which are unacceptable. There is also an interrelated, pending question: will the final outcome of the aspired dialogue be a commonly endorsed narrative or the acceptance of the existence of different perspectives and an effort to learn to deal with them? History education in South Korea is perceived and practiced as a potent way for the development of national identity and the promotion of civic competences. Learning history is about learning who “we” are, where we came from and where we should go. It is also a way to enhance social cohesion by establishing a common ground as regards to the country’s past and its relation to its neighbors. This is especially the case with children of defectors from North Korea who are welcomed to the country as compatriots but have learned a different history about Korea. In South Korea, like elsewhere, History Education is approached as a citizenship related subject. At the same time, there is an ongoing discussion about the extent to which History Education can “serve” the promotion of active citizenship without compromising its “integrity” as a subject. While the attention was drawn to History Education because of content related controversies, new issues are brought to the foreground as soon as the issue begins to be tackled. There is a salient interest among history teachers, which is gaining ground, for better ways to teach history. A tendency for the adoption of history teaching methods which promote historical understanding, student’s agency, the use of sources and generally a more democratic, constructivist approach to learning is visible. As many of the speakers of the conference have highlighted, examples of “how to teach history” from other places in the world are welcomed. EUROCLIO’s work is appreciated and there is an eagerness to learn more about how history can be taught and learned especially in areas which have suffered from or are experiencing conflict. In this dialogue, South Korea seems to have the willingness to share and to learn. Lyu, Seunreul (Kangwon National Univeristy), “Current Issues in History Education and response efforts in Korea”, p. 39-47. Chai, Hyun Jin (Hangyeore High School), Developing a History Textbook for North Korean defector students: Introducing a different approach to Korean History. This concludes the report on Marios Epaminondas’ study visit to Seoul. This study visit has been a part of the project “Dealing with the Past in History Education”, supported by the Robert Bosch Stiftung. For more information on this project, please visit the project page.